This component retrieves data on a Couchbase server and loads it into a table. This stages the data, so the table is reloaded each time. You may then use transformations to enrich and manage the data in permanent tables. 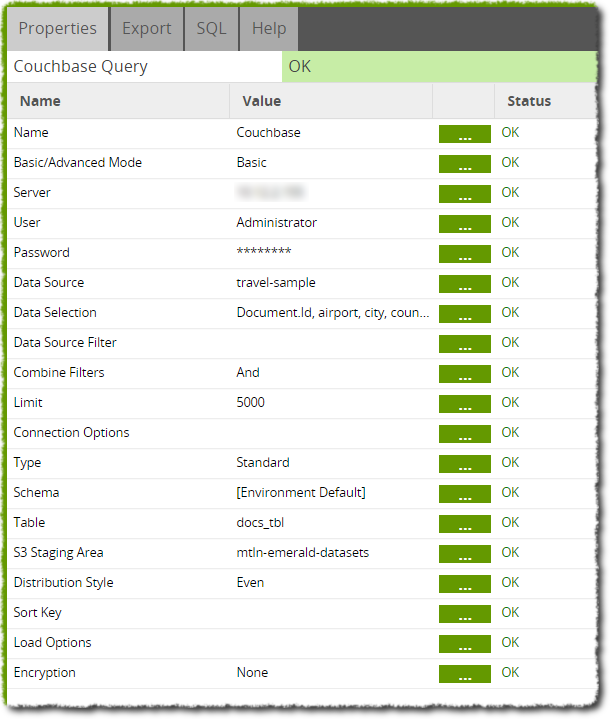 Advanced - This mode will require you to write an SQL-like query to call data from Couchbase. The available fields and their descriptions are documented in the data model. Server Choice Address of the Couchbase server from which data is to be sourced. User Text Login name for the Couchbase server. Password Text Login password for the Couchbase server. Users have the option to store their password inside the component but we highly recommend using the Password Manager option. SQL Text Custom SQL-like query only available during 'Advanced' mode. In this example we will load flight data from Couchbase into a table where the data can be later transformed. The layout for this job is shown below. The job is quite straight forward. We are using the table 'docs_tbl' to load data into - the Couchbase Query component will automatically create this table, dropping it first should it already exist. 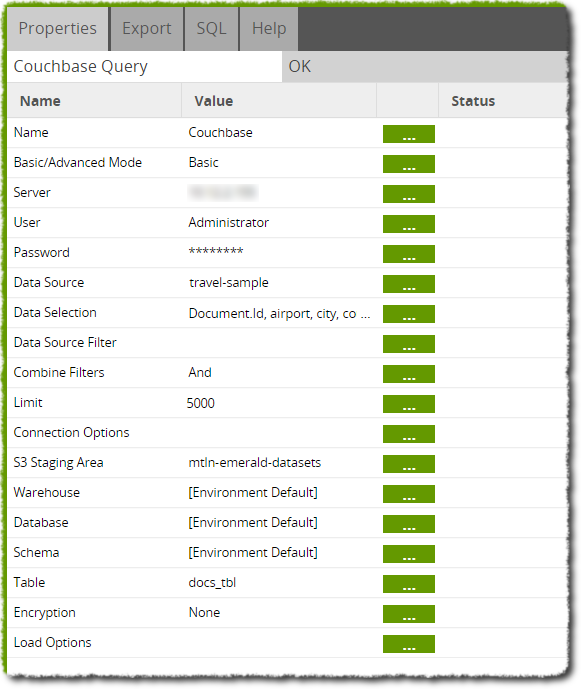 The Couchbase server, with matching username and password, are entered which allows the component to generate a list of Data Sources available. Picking one will then allow us to import to all columns in the 'Data Selection' property. The rest of the component will configure itself with default values that can be used in our job. 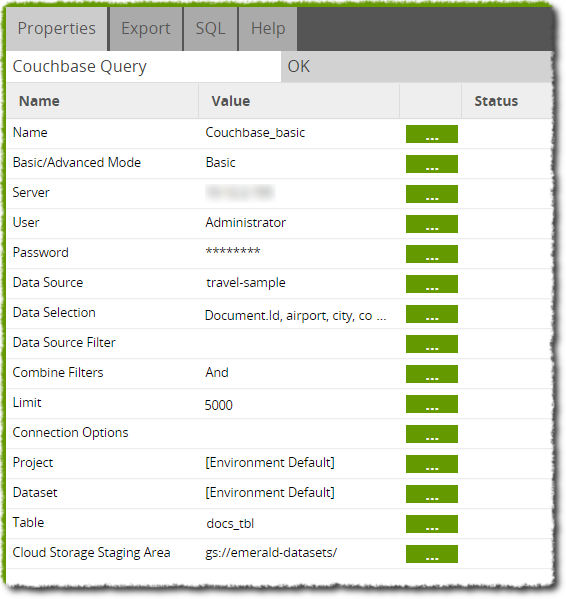 Details of the Couchbase Query component are shown below. Now by right-clicking the job or job canvas, 'Run Job' can be selected to run the job as it currently stands. When this run has completed, we can sample the table using a Table Input component in a transformation job to ensure the data has been loaded correctly.